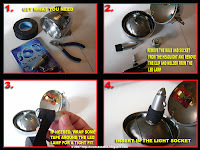 Free advice on how to fix your bicycle: HOW TO CONVERT A VINTAGE BICYCLE HEADLIGHT TO A WHITE LED TAKE 2! HOW TO CONVERT A VINTAGE BICYCLE HEADLIGHT TO A WHITE LED TAKE 2! I recently did a post about converting a vintage bike headlight with a white LED. My feeble attempt at electrical work was just that, feeble. I guess I should never talk again about wiring stuff together since my knowlege of anything electrical is not that great. You are reading a guy who once long ago put a Swiss Army knife to a live electrical panel to unscrew some wires...POW! The fact that I'm writing these lines proves that I am alive and well in spite of this incident and that there is a God for idiots. 3- If necessary, put some tape around the LED to have a perfect fit in the socket. 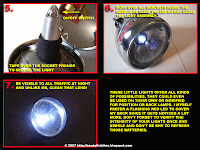 5- Secure the LED lamp by taping it to the prongs of the headlight. 6- Push away or remove any brackets inside the headlight to make space for the LED. Click the LED on and close the assembly and your done. The only disadvantage about this set up is that you have to open and close the light assembly to get access to the switch, but the price is right. These LED lamps could probably be used on there own or for position lights. If any of you make something special with these, don't hesitate to let me know. Til then, ride safe and Godspeed.